I found this old newspaper insert from 1975 and thought I'd share. 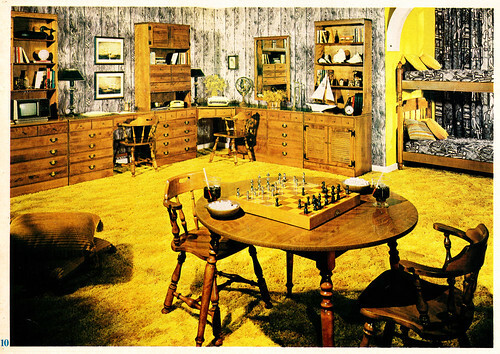 It's an advertisement for Ethan Allen furniture stores, and it really has some nice photos of 70s interior desecrations decor in brilliant color. The pictures are a lot larger than in this post. Click them and you'll land on the Flickr page; then, right click the image to choose a size to view. It's effing complicated, I know. 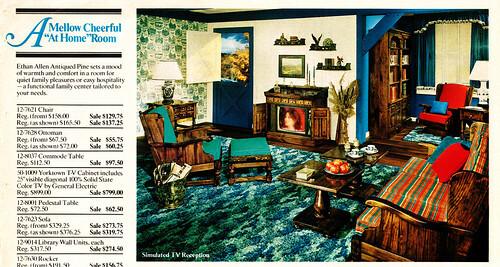 Hopefully, you'll still have fun perusing this gallery of shame vintage decor. Enjoy! 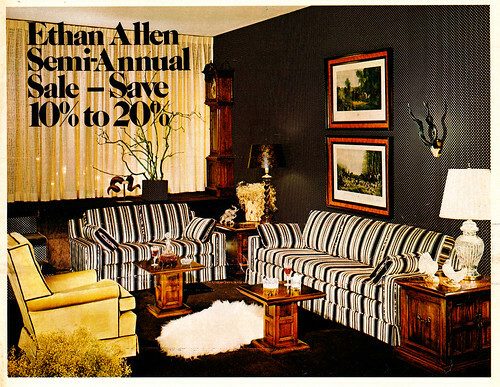 Wonderful Ethan Allen vintage ad. 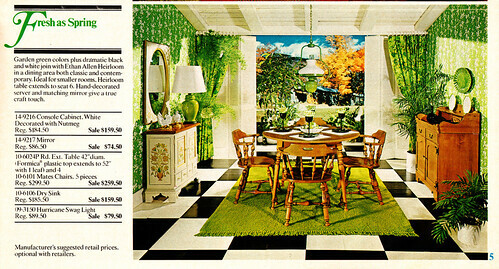 Even for 70s that is eye-burning bad. I didn't bother to go to flickr, the eye strain was enough without blowing them up. 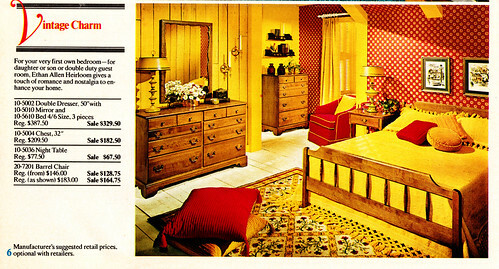 Mid-century is in. Horrible Colonial is not. 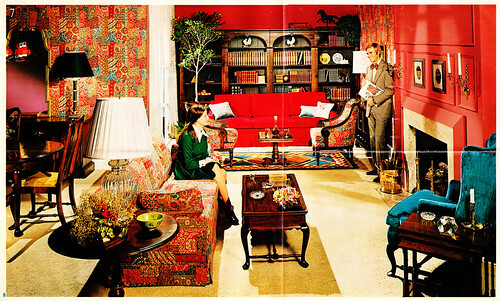 Love the colors in these photos, but can't stand that they tried to make that gross Colonial furniture they make fit in with the mod and groovy times. my god. 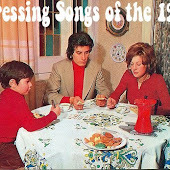 It looked as if each member of the Partridge Family picked a spot on the room and puked. I love these photos. 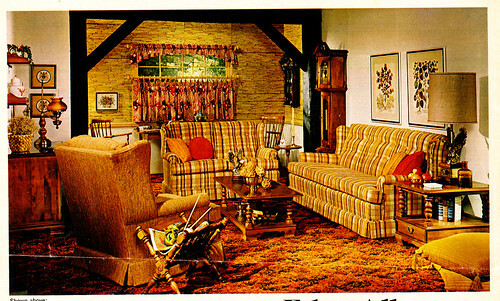 We did have a couch similar to the one in the first picture. 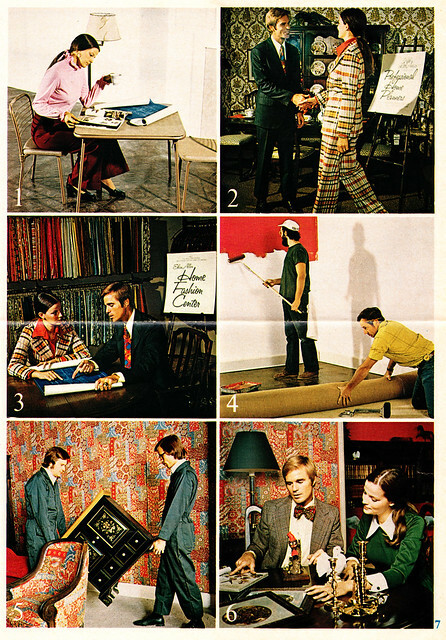 I can't get over the hideous plaid suit the lady wears in the ad. Almost more retinal burning than the furniture. 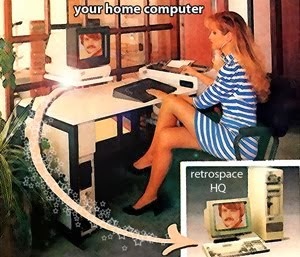 And the woman in the Number Two photo! My eyes!! 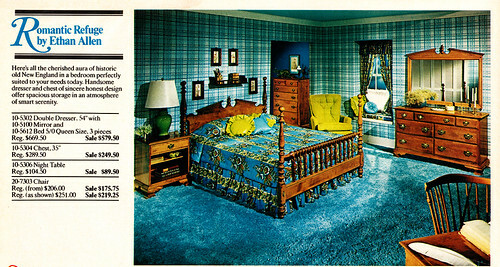 Love the guy in the bowtie looking surveying his horrible room with pride. 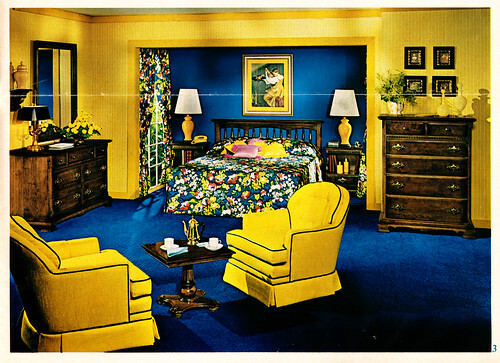 OMG, that blue and yellow bedroom! How on earth could anyone SLEEP in that? 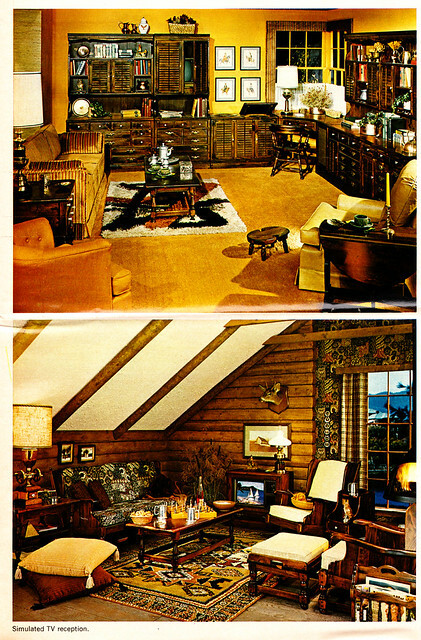 I like some things about 70's decor but I think, for some, it takes at least 50 years for a retro style to become appealing, overall, again. 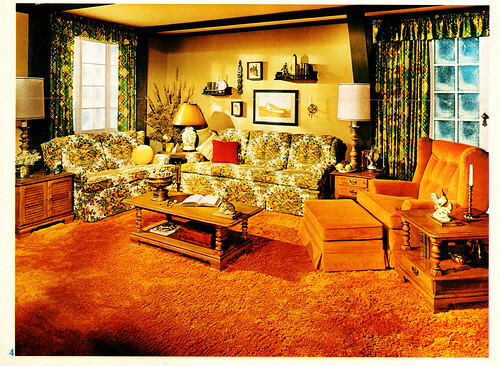 Sadly, change the orange carpet for green in that next to last photo, and you're looking at my living room today. Hubby doesn't want to change around "dad's house", ARG! C'mon you guys!! 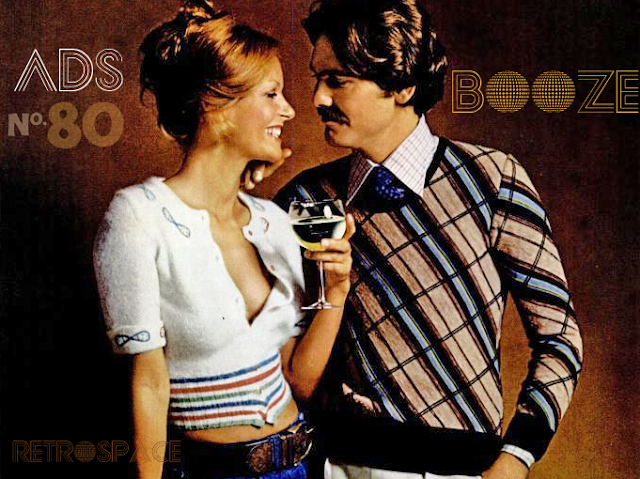 If you had been born in the 40's like I was and had lived all your life in the blahs, well, the 70's look was most exciting! think of it! 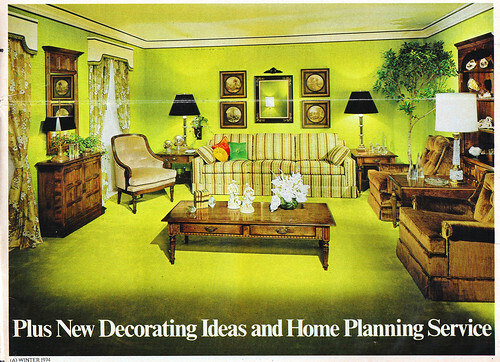 i own the striped black and white couch in the photo talking about the home planning service.except my grandmother had the couch apolstered pink and a matching olive green camel back chair with pink piping.as well as two in tables.she was rather stylish i must say.